In far northeastern France, flanked by the Vosges mountains to the west and the Rhine river in the east, you will find a land of vineyards, castles, and medieval villages. A land that, aside from the larger cities of Colmar, Strasbourg, and Mulhouse, appears unchanged by time – Alsace. I have been a bit obsessed with visiting Alsace ever since a friend shared a bottle of Riesling with me. Most people think of Riesling as a sweet wine, but in Alsace, it is more often a wonderfully crisp, dry wine. Finally, I had found a region which made almost exclusively white wines – wines I love. I also discovered a fascinating history, culture, astonishing scenery, and friendly people who made me feel so very welcome – I am certain I will return again and again. Looking at Riquewihr from the Schoenenbourg vineyard. Tourists to Alsace usually stay in either Colmar or Strasbourg (the capital), and take day trips to visit the picturesque villages along the Alsace wine trail. In particular; Kayserberg, Ribeauvillé, Hunawihr, Zellenberg, Eguisheim, Bergheim, and perhaps the most famous, Riquewihr, are surrounded by the largest concentration of Grand Cru vineyards. This is by far the prettiest part of the wine trail. I highly recommend spending more than a day dashing from one village to the next. Schoenenbourg vineyards and Riquewihr at dusk. I stayed in Riquewihr, one of the most beautiful villages in France (Plus Beaux Villages de France). Ideally situated within twenty minutes of Colmar, it is quite easy to visit the other villages and top attractions of Alsace, from Riquewihr. Beautiful and quiet, Riquewihr at night. While during the day Riquewihr can be crowded (2,000,000 people per year visit Riquewihr), and even a little frustrating, at dusk and dawn, you will have the town to yourself. As I walked along the cobblestone streets lined with colorful half-timbered houses, it was as if I had travelled back in time. Magical! One of the prettiest streets in Riquewihr, especially at night. Up to the 17th century, Alsace was known throughout the Holy Roman Empire for the quality of wines produced there. Large barrels of wine were shipped via the Rhine River all over Europe including what is today the United Kingdom. The abundance of beautiful architecture in Alsace is due to the wealth created in the Golden Age (late medieval age and Renaissance), of the wine trade. Beginning with the Thirty Years War (1618-1648), which was fought mostly in Central Europe, the wine trade in Alsace was devastated. Today however, winegrowers in Alsace are once again speaking of the Golden Age of Alsace wines. The wine trail from Riquewihr to Zellenberg. Riquewihr is surrounded by two noted Grand Cru vineyards, Schoenenbourg and Sporen. You can find mention of these vineyards in texts as far back as the 15th century. The wines produced here can be stored for decades due to the gypsum in the soil of the Schoenenbourg vineyard. Another key factor contributing to their popularity – the wines can be shipped great distances without negative effect. Finally, the terroir of both the vineyards is strongly expressed in the wine. Obviously, if you like wine, Riquewihr is the place to go tasting. It’s not the only reason to travel to France, but it’s a good one! Here are a couple of tasting room recommendations you should not miss! 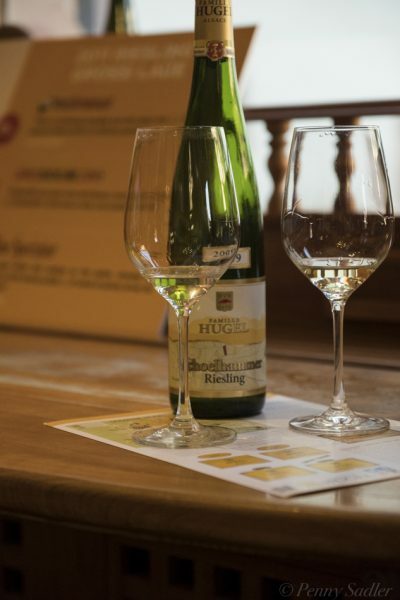 The Hugel family has been making wine in Alsace since 1639. A historical book I read before traveling to Alsace, Wine and War (review coming soon), makes numerous mention of the Hugels and their involvement in the resistance movement during WWII. The history of the family is certainly fascinating…and the wines are superb. Riesling, the king of Alsace wines. At the Hugel tasting room in Riquewihr. The tasting room is on the main street, Rue du Général de Gaulle, so you cannot miss it. Tastings are complimentary – a rare treat with such a popular producer. There are several tasting options to choose from, and the staff will share as much or as little information as you like. Most tastings begin with Gentil, a blend of four grapes, also known as a field blend. It is the only blended wine they produce; all others are single varietal, which makes it interesting to taste the same grape in different vintages. I did quite an extensive tasting there to really understand the terroir of the Schoenenbourg and Spoden vineyards, where the Hugel vines are located. To learn more about the wines of Alsace read my article The Consumer’s Guide To The Wines of Alsace. Since 1574 the Dopff family have been dedicated to the development of high quality wine in Alsace. The grandfather was a forerunner in producing sparkling wine made in the Méthode Champenoise (the same process by which Champagne is made). Today, their excellent Cremant d’Alsace wines have been recognized with both gold and silver medals at the Decanter Wine Awards, as well as the Crémants de France and Luxumbourg competitions. As you may guess, Au Moulin is a nod to the windmill which once was located on this site. Domaine Deiss is in Bergheim, only a ten minute drive from Riquewihr. Honestly, even if you have to take a taxi, just go! Marcel Deiss is widely regarded as one of the top three winemakers in Alsace. His wines are primarily field blends (usually four grapes but sometimes more), a style of winemaking that he has elevated to an art form. Traditionally, only four varietals can be grown in Grand Cru vineyards but, with much passion and persistence, Deiss has overcome these limitations. To say he is a rebel is an understatement. Deiss believes these wines more honestly express the terroir of the vineyards. All I can say is, they are superbe! I will be writing in detail about my tasting at Deiss so check back or add yourself to my email list. Established sixty years ago, the Alsace Wine Trail (Route du Vin) runs 170 kilometers from north to south. It is one of the most scenic and popular wine trails of France. There are several villages that are referred to as The Pearls of the Wine Trail; as you may have already guessed, Riquewihr is one of these gems. From Riquewihr, there is easy access to the trails on both the north and south side of town. If you’re uncertain where to enter the trail or which way to go, you can get a map and directions at the local tourist office, located on Rue De General du Gaulle, across from the Hugel tasting room. If you enter through the Sporen vineyard you can follow the trail to Kietzenhiem, about an hours walk. Or, follow the path through the Schoenenbourg vineyard to Zellenberg. Hikers, bikers, and anyone who enjoys nature will love the vineyard trails. In the fall, after the harvest is complete, the only sounds are the buzzing of bees and the falling leaves. The only other people I saw on the trail that morning. They were walking over from Ribeauville. This is the Schoenenbourg vineyard with Riquewihr in the background. I walked from Riquewihr to Zellenberg – it’s only thirty minutes, and very easy. The scenery is spectacular, so do bring your camera, or at least make sure your cell phone is charged. You don’t have to love wine to enjoy this. When you arrive in Zellenberg, go to the Jean Becker Winery for a taste of their organic and biodynamic wines. The Becker family has been in Alsace since 1610; you’ll see old farming equipment hanging around the crush pad and the tasting room feels like a family-style pub. The Jean Becker tasting room is a short 30 minute walk through the vineyard from Riquewihr to Zellenberg. The outer wall built around 1291. Riquewihr is surrounded by two layers of defense walls. On the west side of town, it is easy to see the inner and outer walls, the Dolder tower, and old winery houses built into the walls. Inside the walls, the tightly packed houses built between the fifteenth and eighteenth century, are perfectly preserved. Riquewihr is one of the few villages that was not bombed during World War II. While being a village of only 1300 inhabitants, Riquewihr is the third city in Alsace for the number of National Heritage buildings, after the large cities of Strasbourg and Colmar. This is one of the reasons Riquewihr is so popular. I spent a week there and still didn’t see everything, though I gave it a good try! Half-timbered architecture on Rue de Général du Gaulle. You’ll notice a style of architecture called half-timbered which is found in Germany as well as France; to describe it in very simple terms – exposed beams and plaster, built on a stone base or foundation. It was very rare for a house to be built entirely of stone because it was more expensive. Also, the forests in the Vosges mountains provided a plentiful supply of wood. Only wealthy merchants had homes made entirely of stone. A rare stone building, this one houses a lovely crystal gift shop. 17th Century. In the 17th century as more people from Paris moved to Alsace, stone homes became vogue as they were considered to be more French, and the half-timbered German style was frowned upon. Riquewihr has the largest number of stone houses in Alsace! Riquewihr at night. Looking east towards the town hall. Did you know that Alsace has the highest number of Michelin starred restaurants in France? Yes, it’s true! And Alsatians really do love their food. To be sure, I was well fed in Alsace! Green sauerkraut braised in wine, delicious! This is a traditional dish and you can only get this in Riquewihr. Alsatian food is a hybrid of German and French influences which leads to some very interesting dishes like sauerkraut in wine cream sauce…delicious! Pork is very popular and, my favorite pasta-like dish, spaetzle. The food can be a bit on the rich side, which works well with a sharply acidic Riesling wine, or in some cases a Gewürztraminer with for example, a stinky cheese. Other local foods to try: Fleischnaka, foie gras, kugelhopf, pretzels, onion tarts, quiches, foie gras, and flambé. A delicious Flambe” much like a super thin crust pizza. Le Grognard, Riquewihr. Riquewihr has about thirty restaurants; quite a lot for such a tiny place! Here’s a list of the top places to try from my friend, Jean-Paul. Riquewihr is very central to anything and everything you’ll want to see in Alsace. The villages of Kayserberg, Hunawihr, Benawihr, Ribeauville, and Eguisheim, are only ten to fifteen minutes drive. You can read more about these gems of the wine trail here. Notice the sign of the wine merchant on the right. Colmar is a treasure of signs and half-timbered architecture. I can not mention Alsace without including Colmar; it is consistently rated as one of the top European destinations for culture and history. Since the period of the Holy Roman Empire, Colmar has been the center of the wine trade in Alsace. My time there was limited, so I took a guided tour. The tour was good for learning some key historical dates and names important to Colmar–in fact–it was a lot more than I could really absorb in such a short time. On a pretty day just walking around Colmar is a real pleasure and the traffic-free historic center makes it that much better. I was enchanted by Colmar and look forward to going back to explore the museums and Michelin-star restaurants. The covered market in Colmar located on a canal. You can see the steps on the side of the building from the time when the canals and rivers were used to move goods around the country. Even though my time was short I have a few key takeaways from my tour. Here’s the link for the tourism office in Colmar. 2. Bartholdi Museum is the childhood home of the man who gave the United States the Statue of Liberty, Auguste Bartholdi. There is a replica just outside of town in a roundabout. Bartholdi was from a wealthy family and spent quite a lot of his own money to make this project a reality, traveling frequently to the U.S. on PR campaigns. He was very prolific as both a sculptor and artist. 3. The Pfister House is a show-stopper! Built in 1537, it combines medieval and renaissance architectural details. You can’t miss it! 4. Petite Venice is perhaps one of the most photographed neighborhoods in Colmar. It’s easy to see why. Get in line on the bridge for your chance to take this classic photograph. Or go back in the off season! This photograph of Petite Venice neighborhood in Colmar, France first appeared on my Instagram account. A highlight of my trip to Alsace was this small but vibrant city, just twenty minutes from Riquewihr. There is a large local market on Tuesdays that seems to be undiscovered by tourists. Near the market is St. Georges, a spectacular Gothic church. This neighbor is full of charming architecture and sidewalk cafes. The real gem in Séléstat is the Humanist Library, which has just reopened after a four year remodel by Italian architect, Ricardo Ricciotti. The new space is light and spacious – really beautiful. This incredible library is comprised of some of the oldest documents in Alsace, and one of the largest collections of medieval manuscripts and Renaissance books, the core of the collection is the library of humanist, Beatus Rhenanus. This incredible is comprised of 423 volumes containing 1,287 printed works, 264 hand-written letters, and 33 volumes of manuscripts. In 2001, the collection was added to the UNESCO Memory of the World register. The books may be ancient but the Biblioteque is very modern and user friendly. Also key to the collection is a copy of Introduction To Cosmography. This book was found to be recorded in 1507 in Alsace, and contains the first use of the word America. In fact, the writer(s) of this book are responsible for naming the new lands, America. There is an original copy in the Smithsonian. Who’d have thought I’d go all the way to France to learn about this? Introduction To The Cosmography; first use of the word America. Legend has it that the city of Séléstat was founded by a giant. Who knows? One thing is certain, in Séléstat you will walk in the footsteps of giants from the Humanist period. As it turns out, America was named for Amerigo Vespucci ! Whether you are traveling solo ( as I was), with a partner, a group of friends, or family, Gites les Remparts de Riquewihr can accommodate you in the heart of the Alsace wine country. Gites (holiday rental),is a collection of fourteen, self-catered apartments, located in historic buildings that have been meticulously restored. Owners Jean-Paul and Martine Krebs have been in the hospitality and tourism business for decades. You will find everything necessary for a fantastic holiday in Riquewihr. All of the accommodations are tastefully decorated by Martine and have been restored to modern standards without losing the historic element and charm. The White Stork, Little Wolf and Fox and Grape, are a few of the more popular rentals. If you have a special need just ask when you book. Jean-Paul and Martine have recently remodeled a former winemaker’s home built in the 1500s. There are six apartments in this building and some have access to a private garden courtyard. You have only to look outside for views of the most famous vineyard in Alsace, Schoenenbourg. Each apartment has a fully equipped kitchen, wi-fi, satellite television, and maintains the original architectural elements. My favorite accessory was a book (organized by Jean-Paul), with all the information needed to make a stay in Riquewihr as easy as possible: a complete list of restaurants, maps, addresses of wineries, it’s all there. Additionally, Jean-Paul and Martine are locals in Alsace and can offer insider information that you will find invaluable, especially if you are in Alsace to go wine tasting. The Little Wolf apartment has received a 5 Star designation. You may rent a studio apartment or an entire house for a family holiday. I stayed in the Sylvaner apartment on the main street Rue de Général du Gaulle. Large enough for two people, it had a full kitchen, dining table, small sofa and television, (though I never once turned it on). I stayed here for one week; by the time I left I had begun to tell the time by listening to the nearby church bells. It was the ideal location for me–during the day I was out wine tasting, visiting museums, and walking the vineyards. But at night I came home to the almost deserted streets of Riquewihr. Devoid of crowds, I had time and space to compose my photographs and absorb the atmosphere. I thoroughly enjoyed my time there. You can also follow Jean-Paul on Facebook at I Love Riquewihr. Riquewihr has many side streets that allow you to wander away from the main tourist area. Alsace borders Germany, and Switzerland. If you fly to Germany, the closest airport is Frankfurt. From there, you can take a train to Colmar via Strasbourg. Once in Colmar, you can either rent a car or take a bus or taxi to Riquewihr. From Switzerland, you can fly into Zurich or Basel. Basel is by far the best choice because you are only one hour from Colmar. However, I flew into Zurich and took the train to Colmar via Basel–either way works. It is handy to have a car to get around, but it is not necessary. I think it depends how long you plan to stay. For a short trip I’d skip the car, but for a longer trip, it would come in handy. I stayed one week without a car and had a guide much of the time. So, tell me, have you been to Alsace? Where did you stay? If not, when are you going? If you are interested in any photos from this article please contact me. All photos are mine except from those marked Jean-Paul Krebs. All rights reserved by respective owners. This is one of my favorite regions in France. You did a wonderful job covering it. I can’t wait to return. Haven’t been to Alsace yet. Really want to do the wine tour. Riquewihr looks like a terrific place to do it.Photos are great. Riquewihr is delightful. thanks for the compliment on the photos! Wine, Castles, and Culture! Three of my favourite things. Thanks for this tremendous post about Alsace. It definitely makes me want to add it to my bucket list. We loved Alsace, and especially the wine route. Such faiytale villages and some great wine. great post keeps up the good work. great post, keep up the good work!!! I fell in love with Colmar and the villages! Have been back once and can’t wait to go back!!! Great article and information! Thanks Wanda for the nice comment and taking the time to read my blog. Will you be going back any time soon? Having recently returned from Alsace, your photos and prose took me back! What a beautiful post! Thank you Irene. It’s a lovely place and I’m glad to hear you also liked it. I’ve just been studying Alsace for the French Wine Scholar exam. Your article brings the region to life and gives real-life context to the text and maps. Well done! Lauren, That is so cool about your exams! Thank you so much for taking the time to leave a comment. Have you been to Alsace? Beautiful post — love the images! Thanks Jill! you made my day! Beautiful description of Riquewihr and the aera. Eric! It was such a nice meeting. I hope we can meet again next year! I followed along your trip with the photos you posted on Instagram. Riquewihr looks magical. I think staying in small towns while sightseeing (or wine tasting) in an area is a good idea. Helps one to soak up the atmosphere. That’s a great way to describe it. Although Colmar isn’t huge, it is not the country!